His Pitt-Johnstown Experiences Led to a Dream Job - and an Emmy! 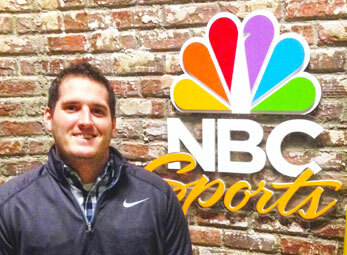 Matt Ziance '13 is a Social Media and Consumer Engagement Coordinator at NBC Sports and part of a team that won the Sports Emmy Award for coverage of the 2016 Summer Olympics in Brazil. The announcement was made May 9, 2017. Specifically, the Social Media & Consumer Engagement Team won the Outstanding Trans-Media Sports Coverage for the Games of the XXXI Olympiad for coverage of the 2016 Summer Olympics in Rio. Ziance has worked for NBC Sports since 2014. His assignments take him around the world, but he typically works out of NBC Sports Group World Headquarters in Stamford, CT. Previously, Ziance was part of a team nominated for an Emmy for its coverage of the 141st Kentucky Derby in 2015. Ziance manages social media accounts for NHL on NBC, NASCAR on NBC, NBCSN, NBC Sports, NBC Olympics, NBC Sports Soccer, and Sunday Night Football via Twitter, Facebook, Instagram, Vine, Periscope, Meerkat, Tumblr, and Pinterest. His journey to that dream job began at Pitt-Johnstown. “The decision to attend the University of Pittsburgh at Johnstown was an easy one,” Ziance said. “Allison (Ziance) Endler – my sister – has a very successful career in the mechanical engineering field and both of my parents have great professional careers that all started while attending the University of Pittsburgh at Johnstown. Planning and preparation are key in sports coverage, which is a fast-paced world of perpetual deadlines and revolving priorities. Ziance said he entered the field prepared. “The way marketing is set up at Pitt-Johnstown helped me because of the time-management skills learned, the proper way and confidence to give a full and complete presentation, how to adapt to an ever-changing market, and the ins and outs of marketing,” he said. Ziance cited three keys to his Pitt-Johnstown experience that "all related to a ‘Real World’ experience: in the classroom, on campus, and out of the classroom. “The professors were the best part of my in-classroom experience," he said. "Dr. John McGrath, and professors Skip Glenn, Doug Reed, and Ron Vickroy all had a tremendous impact on my life. The learning experience in the marketing department is greater than I could have ever imagined because it’s more than just a student-teacher relationship. All of my professors truly cared about my aspirations for the future, brought countless years of real-world marketing experience to the table, and were there every step of the way. It’s great to still be in contact with them." “The great thing about being a student at Pitt-Johnstown is the experience you get being a member of a club or organization," he said. "I was involved in Alpha Phi Omega (National Service Fraternity), Sigma Tau Gamma Fraternity, Pitt-Johnstown Lacrosse Club, Student Government Association, and more! One of the greatest moments in my college experience was when I was President of Sigma Tau Gamma and we won Pitt-Johnstown Organization of the Year out of 81 student-run organizations. It was great to see 45 young men come together, work hard as a team, complete more than 800 hours of community service, raise thousands of dollars for charitable organizations, and break a negative stereotype surrounding fraternal organizations. That testament to persistence punctuated an academic career and spurred Ziance’s step to network television sports. “My time spent at Pitt-Johnstown was unforgettable. I’m working for one of the most recognizable brands in the world, and this is my first job since earning my degree, which speaks very highly on what Pitt-Johnstown has to offer,” he said. Ziance’s path to success is a clear one that he gladly shares. “College is what you make of it. You can do the bare-minimum to get by or you can have the mind-set to work harder than anyone else, get involved in as much as you can handle, and really set yourself up for an enjoyable career path once you graduate. If you choose the latter, the professors and the University of Pittsburgh at Johnstown set you up with the necessary tools and knowledge to have that enjoyable career,” he said.